Are you a germophobe? Do you cringe when someone coughs near you on the subway or a coworker in the office can't stop sneezing? 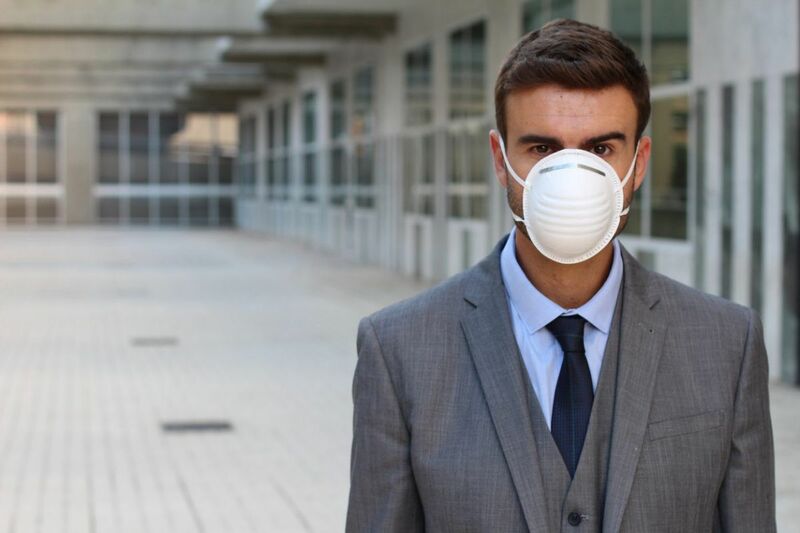 Do you walk around the city wearing a surgical mask? Normally, I am not, but the current severe influenza season is making me nervous. I recently had a mother and three children in my office. All three children were very uncomfortable with sore throats, coughs, runny noses and fevers. They also had headaches and some nausea. Although the mother was still well, she was afraid she would get ill and not be able to properly care for her loved ones. The kids ended up having three different illnesses: one had Influenza A, one had Influenza B, and the other one had neither. All of the children were negative for strep throats. The mother was exhausted. I convinced her to have all three children get flu shots and anti-flu antiviral medicine so that they would not trade diseases. I also suggested that the mother get the same from her doctor. I spent a half-hour in the exam room doing the best I could to alleviate the family's distress. When I left the room, I felt as if I were getting ill. I realized that I was suffering from what doctors call "sophomore-itis." What is it? You first study clinical illness in great detail in the second year of medical school. And, after each illness is introduced, you are sure that you have it. Lymphoma? I have a swollen node in my neck; it must be lymphoma. Crohn's disease? Yes, I have it, I had a stomach ache just yesterday. After that visit, I had to remind myself: I had a flu shot, washed my hands for 30 seconds before and after each patient, and it takes several days to get the flu. I was probably not infected, but felt clammy through the afternoon and even when I went home. It is not that doctors do not get ill from their patients. For my first year or two of practice, I had every minor childhood illness — in spite of good cleanliness — until I had built up an immunity to all the common germs. I caught a virus called Coxsackie about 25 years ago that resulted in my acquiring a severe case of myocarditis and almost dying. However, I knew in this instance that my symptoms were purely in my head probably because my heart ached about that poor family. That same night I saw a TV show called Sheldon, in which an 11-year-old boy takes warnings by the media during a bad flu season to heart and tries to isolate himself from everybody. Watching this cute little germophobe, and realizing how silly it was, cured my symptoms very quickly. So what can you do to stay well during this severe flu season? First, get flu shots for everyone in the family, including yourself. There is misinformation out there that the flu vaccine is dangerous, but this is simply not true. Even people with an egg allergy can get it under the correct circumstances. Wash your hands with soap and water for at least 15 seconds four to five times daily, especially after touching other people. Hand sanitizer is fine as long as you do not have any dirt on your hands, but it is not as effective. Stay home if you are ill and limit touching others, if you can. This also applies to medical personnel such as doctors and nurses, but they are not good at missing work. If someone comes to work ill, convince that person to go home. Wear a surgical mask if you are sneezing or coughing and change it if it gets wet from secretions. A good rule is stay home for at least 24 hours if you have a fever (over 100.4 F) and do not go back to work until the fever is completely gone. Finally, if you a worrier, like me, remind yourself to act sensibly.